Sampler House 3 [D6610] - $12.00 : Yarn Tree, Your wholesale source for cross stitch supplies. Cross stitch pattern from Plum Street Samplers. 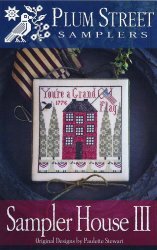 The verse "You're a grand old flag 1776" is accented by a tall red house, an eagle, and flags. Stitch count 98w x 99h. Stitched on 36ct Star's Hollow Blend #8398.